← Who are the winners of Seoul Drama Awards 2015? The yearly music event to celebrate Malay music in the South East Asia region is back in Singapore. Anugerah Planet Muzik is a platform to give recognition to the musicians from Singapore, Malaysia and Indonesia for their hard work in the Malay music industry. In conjunction with Singapore’s Golden Jubliee, audience can expect a star studded show with spectacular artists from across the region and song performances which have graced the Malay music scene for the past 50 years. You can also expect performances by Taufik Batisah, Dato’ Siti Nurhaliza, Rossa, Akim & The Magistrate, Hazama, Afgan, Kunto Aji, Iman’s League, Aisyah Aziz, Alif, Kaka, Ryan Sufiyan, Cakra Khan, Elizabeth Tan and many more. The nomination list is out and there are five categories, Social Media Icon, Most Popular Artiste (Singapore), Most Popular Song (Singapore), APM Most Popular Song, APM Most Popular Artiste, where you can play your part by voting for them on Anugerah Planet Muzik’s Facebook Page till October 1, 11.59pm. We are so happy that some of the performers we interviewed are nominated such as GAC, Sezairi, Taufik Batisah, Shila Amzah, Yuna and Tulus. Congratulations everyone and we hope you will clinch the award! 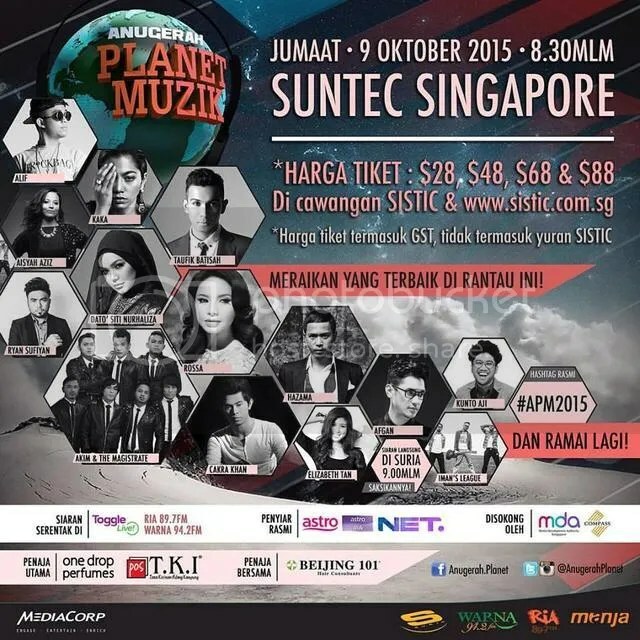 To be part of Anugerah Planet Muzik 2015, get your tickets now on SISTIC! See you there!